Home 'n Hosed: Ethan is here! Ethan Clive Wagener arrived on October 25th at 9:50 in the morning. He is 8lb 5oz and 22 inches long and is a perfect little cutie. He was delivered at Vanderbilt University Medical Center by Linda Hughlett, one of the Vanderbilt Nurse Midwives. We got to the hospital at about 8:30 in the morning, my water broke at about 8:45. It turned out that we got to the hospital too late for an epidural (or any other pain medication) but the Labor and Delivery Nurses and Linda made the experience as relaxed as possible -- they were wonderful! As typical parents, we think our baby is the cutest little boy we have ever seen and we fell in love with him instantly! Ethan's first visitors were Grandma and Grandpa Wade, who arrived moments after he was born and heard his cries from the hallway as they were walking in and Uncle Russ, who arrived just a few minutes after them. He has been a great baby so far and has also met his Aunts Sarah and Ashley, Cousin Mackenzie, Grandma Dianne and Grandad Colin. 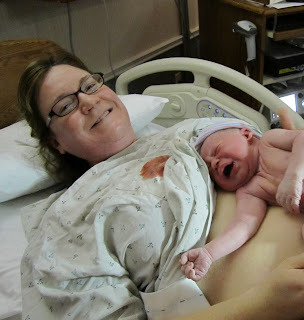 Grandma Wade meeting Baby Ethan in the delivery room. Grandpa Wade meeting Baby Ethan in the delivery room. Russ, Ashley, and Mackenzie with Ethan. from New Zealand and came to the hospital, luggage in tow. A sleepy, but happy Daddy. PS. I think walking up all those stairs at Percy Warner Park on Oct 24th must have helped move things along! !